When it comes to morning porridge, I tend to stick with oatmeal (it’s the easiest to satisfy even the littlest member of the family). However, if I’m just cooking breakfast for myself, I make a cracked grain porridge. Running a grain in a coffee grinder or blender for a few pulses creates a mixture that will become lush without even trying. 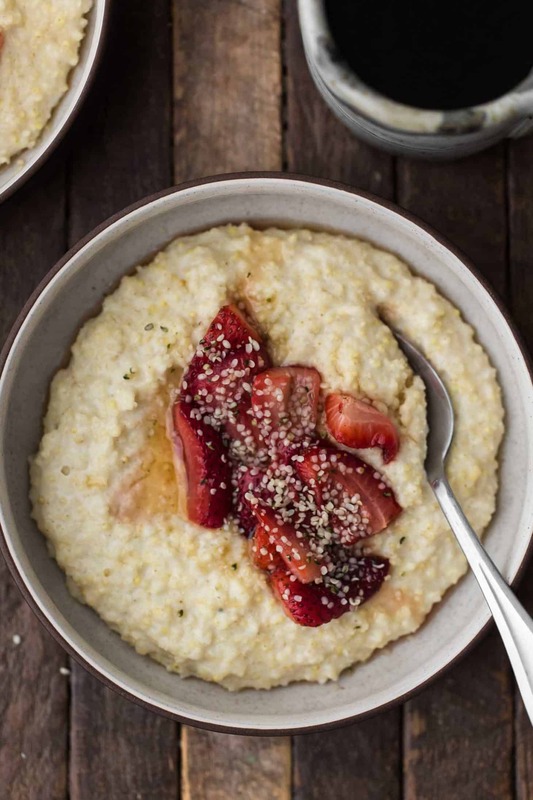 This creamy millet porridge has long been a favorite. Add your favorite toppings including fruit, nuts, and seeds then you’ve got a filling, nutrient dense breakfast. 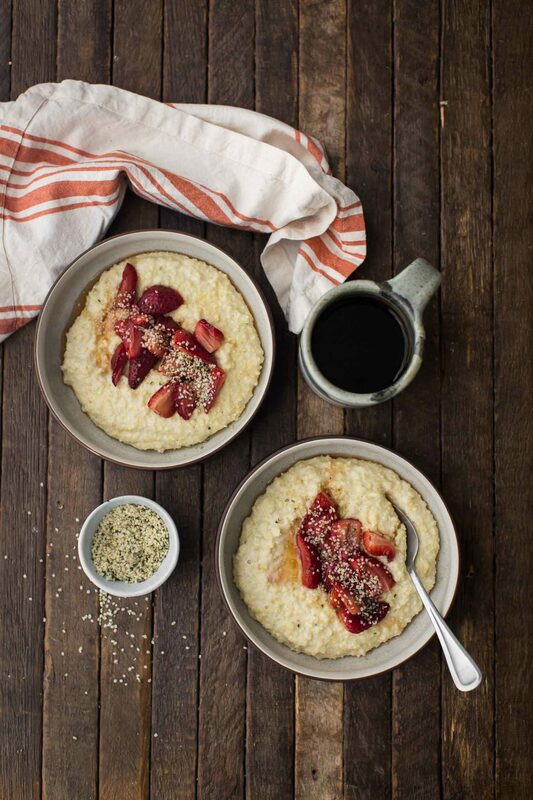 A hearty, gluten-free breakfast porridge featuring home cracked millet topped with maple roasted strawberries and hemp seeds. Preheat oven to 375˚ F. Toss strawberries with maple syrup and cardamom. Roast for 15-20 minutes or until strawberries are soft and juicy. In a coffee grinder or blender, pulse toasted millet. 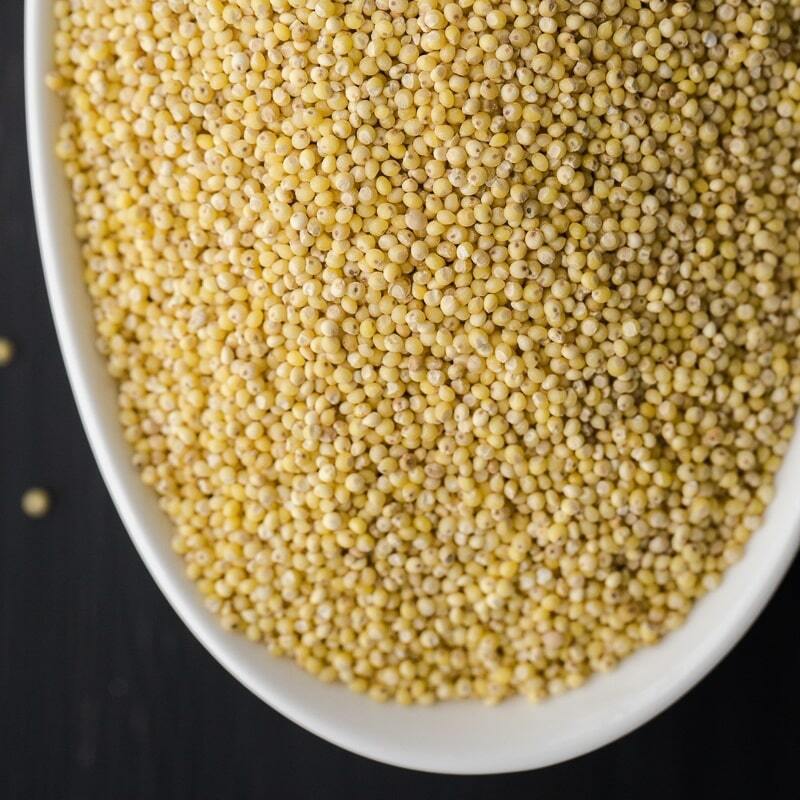 Millet should be roughly half grain, half flour consistency. Heat a small skillet or pan over medium-low heat. Add the butter and melt. Stir in the millet and lightly toast for 3-4 minutes. Add the milk and water. Bring to a boil, reduce to a simmer, cover, and cook for 15-20 minutes. Stir the porridge occasionally to check consistency. Millet should be porridge consistency and grain pieces should be soft. If grains are not soft, add a bit more milk and continue to cook until grains are tender. Serve with roasted strawberries, a bit of heavy cream or milk, and a sprinkle of hemp seeds. Tips & Tricks: Swap the milk/water for whatever your favorite alternative milk is or use all milk for a creamier consistency. One of the great things about this recipe is that it’s a suggestion, a base. There are so many possibilities that I could probably create a whole series on grain porridges with toppings. Grains: I like to stick with more quick-cooking grains like this millet porridge but also quinoa, pearled farro, amaranth and teff (the latter two are amazing porridges without cracking the grains). However, sorghum, wheat berries, and einkorn work just as well- they just take a bit longer to cook. Sweet Toppings: Depending on the time of year, whatever fruit is in season would work. Or, use jam/curds for citrus. Savory Toppings: Savory porridge is easy with roasted vegetables (especially root/winter vegetables) and a fried egg. A couple of my favorite: roasted sweet potatoes or for summer, fresh tomato bruschetta. I am so the same way. Once I get overwhelmed, the small things become bigger than they need to be, and I have to stop and go, wait, before things get out of control. This porridge looks so good! Sorry you were having an off day! But it sounds like this porridge did the trick. Gorgeous recipe and photos, as always. I can totally relate to days like that! Usually walking the dogs + getting fresh air is a big help. This porridge looks excellent. Looove millet! This recipe is so beautiful I could cry! This looks delicious!!! Never thought of either of the two processes…thanks! Gorgeous photos! Love the idea of adding roasted strawberries to a breakfast meal! Strawberries roasted in maple syrup?? What the what! I’ve never thought of this- excited to give it a try! Those roasted strawberries look so good! You photos make me want this for dinner! 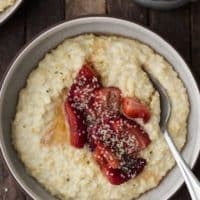 I love the idea of the the cracked millet to create the right consistency for a creamy porridge. I really need to try this, I’m sure my baby girl would love this too! Oh man, I’ve got a huge weakness for millet. The nuttiness sounds like it would be absolutely delicious paired with strawberries, I’ll have to try this one soon! I am drooling over this. This sounds and, from your photos, looks amazing! I cooked this with blueberries instead of strawberries and wow. Probably my favourite breakfast meal to date. That’s wonderful! It’s a favorite of mine too! 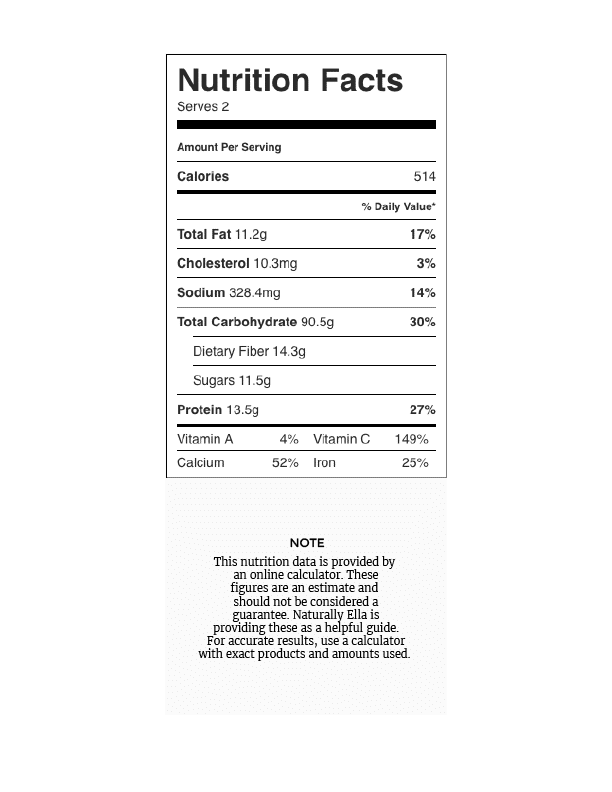 Would almond or coconut milk work for dairy free? I’ve never tried it but I think you would be fine. You’re post are always so great. I always get flustered and then every little thing drives me mad, glad to see I’m alone. It had never occurred to me to grind up the millet, brilliant! I made a big batch your way and just heated a little up each morning such a time saver! Love this! I will try it tomorrow morning! Your photos are amazing, congratulations for your beautiful blog 🙂 See you! If I were to make this with quinoa would I need to grind the quinoa the same way you do the millet? I typically don’t crack quinoa when I use it in porridge because it doesn’t thicken quite the same way as millet.